Deck Cleaning, Refinishing & Staining Services. Repairs & Restoration. Omaha, NE. The Deck Pros! When spending time with family and friends in your back yard, your deck is the epicenter of the activities. Unfortunately, if left unprotected from the effects of the sun and our harsh Nebraska weather, your deck will age quickly. Let Scott's Painting & Staining Inc. help you keep your investment looking its best for years to come with regular deck maintenance and protection. Specializing in Cedar Deck Staining, Maintenance, Restoration & Repairs. We also stain, porch railings & posts, patios, porch decks, fences, gazebos, pergolas, kids’ playground equipment, and other outdoor wood and composite materials. We begin by chemically cleaning and power washing any surface prior to sanding and staining. Tired wasting your summer sanding or maintaining your large deck yourself? Are parts of your deck loose or rotted? Then we are the professionals you have been looking for, for all your deck sanding and finishing needs! 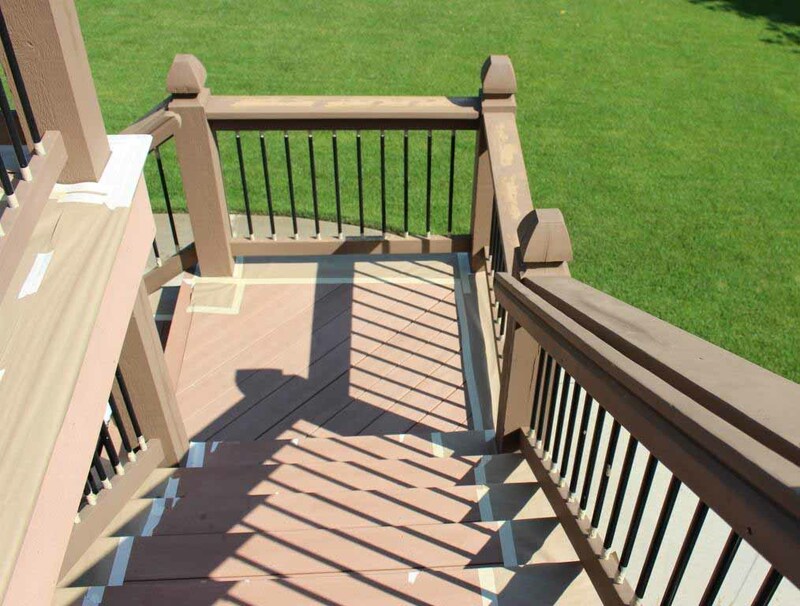 We perform all repairs, such as deck board replacement, leveling steps and staircases or tightening railings and posts! We will have your deck renewed in no time! Deck staining when done properly is a labor-intensive process, especially the preparation. Sanding, preparing and staining your deck, handrails and stairs can take hours or days if it has not been properly stained and maintained. Contact Scott’s Painting & Staining Inc. - Omaha's Premier Deck Staining Contractor - professionals who bring quality and longevity to your wood deck staining project. We are Trex decking power washing & staining specialists, using the manufacturer recommended SuperDeck line of Sherwin Williams stains. We also offer composite deck cleaning and composite deck power washing services. Wooden decks require regular maintenance and waterproofing to preserve its color, wood-grain, and longevity. Nebraska is a harsh climate for decks, all year long, your deck is exposed to rain, snow, sleet, ice, temperature swings and ultraviolet rays. Staining your deck helps protect it from all of these elements, especially the damaging effects of UV rays. Prevent Sun-Damage - Untreated or unsealed wood takes a lot of damage from the sun’s harmful UV rays. It will destroy the wood’s natural color, warp, splinter, dries it out and makes it much more susceptible to cracks. Using a high-quality stain, like Total Wood Preservative by Gemini, on your deck prevents the sun’s rays from penetrating the wood and ensures the deck’s maximum longevity. When choosing a color please consider that a very light or clear deck stain offers very little UV-resistance. 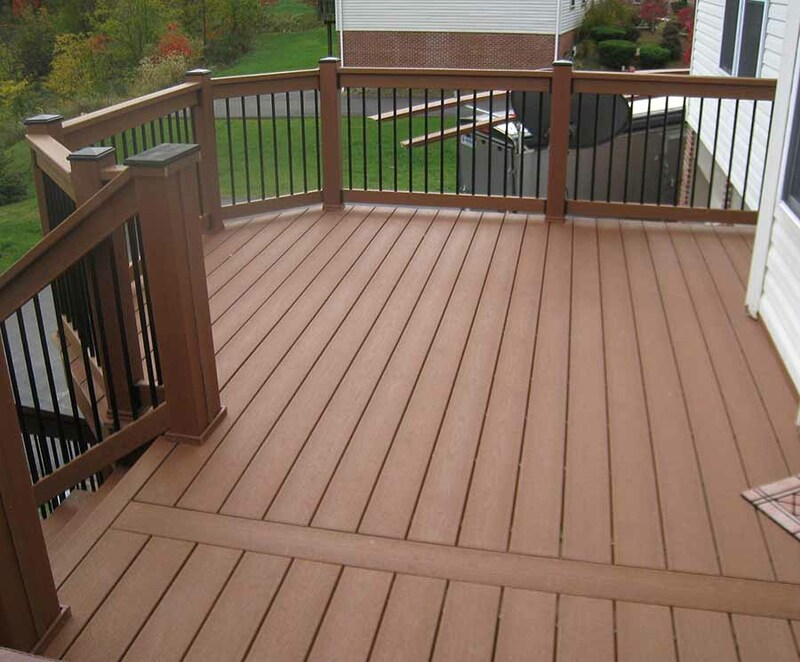 Resist Moisture - Deck stain helps to prevent moisture from soaking into the wood. By keeping the wood dry it will prevent mold and mildew growth, increasing the life of the deck and preventing soft or rotten areas which can lead to costly repairs. Avoid Cracking & Splinters - Unfortunately sealing or staining a deck will not prevent all potential wood issues. Cracking can happen to all decks as they dry out over time. Between the sun and natural ageing, your exterior cedar deck wood can start to crack. Using an oil-based stain will help keep necessary moisture in the wood while keeping excess water out. Think of the old adage, oil & water don’t mix. This is true even in the type of stain used to protect a deck. Additionally, oil-based stains will penetrate better and will not "peel" like a latex-based stain will. Instead oil-based stains will "wear" down over time. The entire deck will be cleaned with a high-pressure power wash. If the wood has weathered, grayed, or has mildew or algae we will use a chemical cleaner & brightener, to help with deck mold removal and to restore the wood to its natural color while killing the mildew spores. Deck washing leaves a clean surface for the new stain to penetrate into while helping brighten the wood. A complete and thorough high-pressure washing is imperative if you want a finish which will last. After powerwashing the deck it needs time to dry out. We recommend at least a day before staining begins. When selecting a color or finish for your deck keep in mind a clear finish has a limited amount of UV protection. This means most clear finishes will last only a year at best, before they need to be refinished. 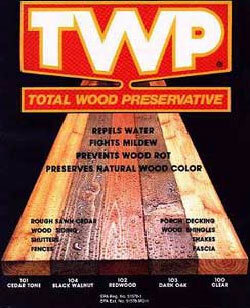 The deck in Figure 1. was finished with TWP (Total Wood Preservative) in CedarTone color. The pigmentation in the color greatly adds to the UV protection of the finish. 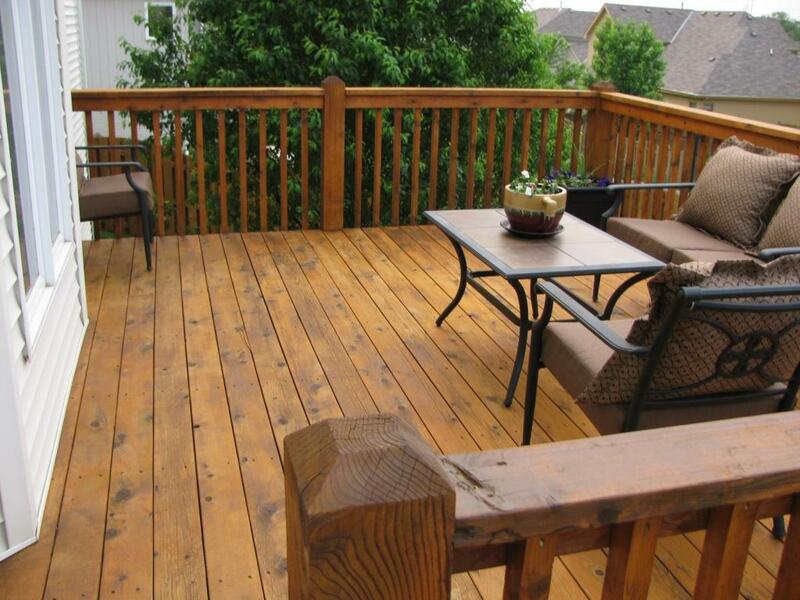 The CedarTone color is the most popular color for deck staining in the Omaha area. It simulates a natural cedar-color. Any nails or screws which have loosed or raised, perhaps due to the wood shrinking as it dries, will be recessed back into the surface. When Scott's Painting & Staining Inc. repairs areas of a deck, we use deck screws and ring shank nails, which slide into the wood but have arrow shaped rings to keep them from loosening back out over time. Rough areas of wood & railings will be lightly sanded. This allows loose splinters to be removed to give the finished wood a smoother surface. Major sanding to remove sealants is only performed when specified in the contract. Before staining is started, we mask and cover areas not to be stained, such as the side of the house, steel or glass railings, and surrounding areas. Multi-level decks are masked on all sides and underneath. Scott's Painting & Staining Inc. primarily uses TWP - Total Wood Preservative which is a semi-transparent, oil-based stain. 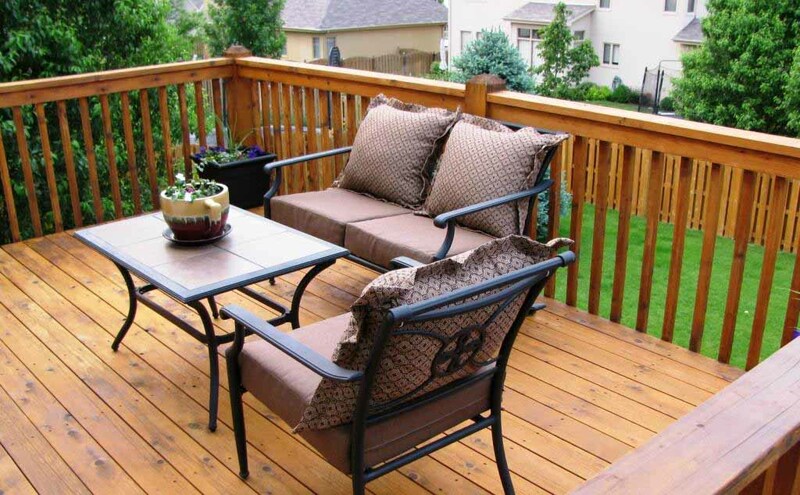 The most popular deck color finish in Omaha, which you see on most Decks & Fences in the area is 'CedarTone 101'. Oil-based is the best stain for decks. Oil stains offer better wood penetration, longer life, and they will slowly wear down, and will NOT peel. Oil-based stains cannot be used over latex. The entire deck would first need to have all of the latex stain sanded off. Latex-based stains, also known as water-based stains, are more like a glorified paint. Deck painting is never recommended and latex-based stains are only 1-step away from a paint. Generally latex-based stains are used when covering old or extremely weathered decks. Latex is a coating, not a penetrant, so all Latex-based stains will eventually peel-off. Latex should only be used as last resort, but they are available in any color. A Natural Clear or Transparent stain will allow the full look of the "natural" deck to show through. It is like a clear coating for your deck. Unfortunately, a clear coating has very little UV protection and usually has the shortest lifespan of about 1 year. The wood-grain or previous coating will show through to some degree with Semi-Transparent stains. Most oil-based stains will be semi-transparent. This is what we recommend for most of our clients. Solid-color stains cover the previous coatings like a paint, therefore any color is possible. Solid stains are generally latex-based. Any trees or shrubbery near the deck will need to be trimmed back about 1 foot so enough space is allocated for staining. This makes it easier to properly apply the stain and will also keep the fresh finish from getting marred as the wind moves the shrubs. Any grills or deck furniture will need to be removed from the deck. These may want to be placed in the garage because everything will need to remain off the deck for few days after the stain has cured. 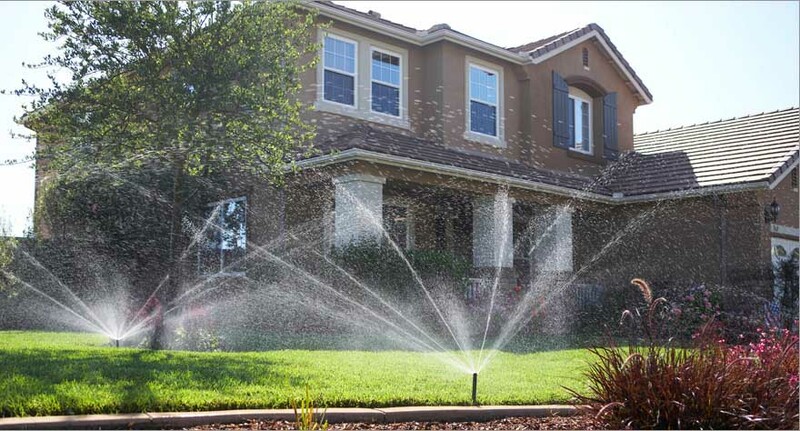 Turn off your automatic sprinkler systems for the duration of the project. The sprinkler should be adjusted if they are getting your deck wet, to prolong the life of your new finish. During the process of cleaning, preparing and staining your deck, it needs to remain dry.